NOTE: This feat tree is completely and totally out-of-date (and likely soon inaccessible). Instead, please consult the Full Rules Document. Many years ago, Matt penned the article The Elephant in the Room: Feat Taxes in Pathfinder, which provided an alternate take on feat progression in the Pathfinder RPG. This write-up was surprisingly popular, and eventual became the most visited page on this website by a significant margin. It has popped up on Reddit, The Giant in the Playground, and the Paizo forums, and is now used in a multitude of home games across the world. Despite all the good ideas it brings to the table, the article was more of a proposal than a polished rules document. Many finer points – such as feat prerequisites – were overlooked in favour of big picture ideas. Although many players have filled in the gaps on their own, there was still quite a bit missing in regards to rules and implementation. 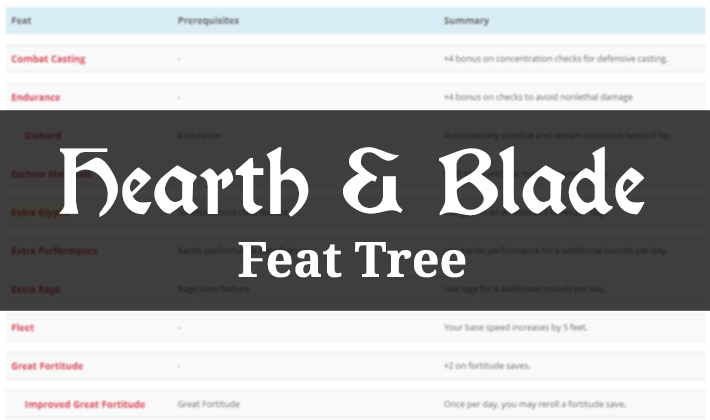 Well, we hope to make things a bit easier for everyone with the creation of the Hearth & Blade feat tree. This feat tree is the natural evolution of the aforementioned article, and presents the new “taxless” feat system in an easy-to-read format. We’ve even tossed some new and revised feats into the mix, to help even out builds and give PCs more options. The feat tree features 99% core content. Specifically, we tried to focus on rules found in the Pathfinder Core Rulebook. There is a fair amount of content designed specifically for Hearth & Blade, our work-in-progress campaign setting. If you have any feedback on the feat tree, feel free to comment below! These sorts of things need to be play-tested vigorously, so your input is welcome. Which of the revised feats would work well in a normal 1- 20 lvl campaign? Of note, Using Spheres of Power rules for magic. Most of the feats should be good to go as-is, but I’m unsure how they would chain together with higher level feats. I’d just keep an eye on feat prerequisites and try to make it so PCs don’t get access to high level feats too early.